What are the 6 Basic Profile Types? Ninety nine percent of all individuals who take the Extended DISC Assessment are a combination of DISC styles. The Basic Profile Types describe the 6 DISC profiles that are a combination of two DISC styles. They are the second most common profile type, following profiles with three DISC styles. They are DI/ID, SC/CS, IS/SI, DC/CD, DS/SD and IC/CS. The order of the identification of the basic DISC profiles is not critical. Why do we need Basic Profile Types? We can easily describe a D-style or a S-style, but it can be more challenging to describe a DS profile or an ID profile. The Basic Profile Types help us to describe a person’s style beyond just their primary style. It is simply another way to describe profiles with two DISC styles to help us to understand ourselves and others better. The “I Sell – I Lead” profile identities a person who has a combination of D-style and I-style above the middle line on their Profile II graph. They are located on the Active right side of the Extended DISC® Diamond model. Active styles prefer to work in a faster-paced environment, are less focused on details, inclined to make decisions quicker, and are more comfortable with change. These profile types are not automatically leaders or sales professionals. “I Sell-I Lead” profiles tend to have clear ideas of what they want. The I-style side of the person is comfortable persuading and promoting their ideas. The D-style side of the person is comfortable pushing their ideas through. “I Sell-I Lead” profiles tend to act independently and focus on moving forward. They are motivated by clear goals and challenging tasks. The “I Execute” profile identifies a person who is a combination of S-style and C-style. Their profile will show up on the Reserved left side of the Extended DISC® Diamond model. Reserved styles are naturally more quiet. They prefer to work in proven environments; the here and now. They want to know the details and tend to be slower to make decisions. The “I Execute” profiles are the “doers” of the styles. They get things done, and if given clear instructions, they will do it correctly. They will do what is agreed upon by following the rules and guidelines. These individuals find motivation in clear instructions and one-on-one feedback. 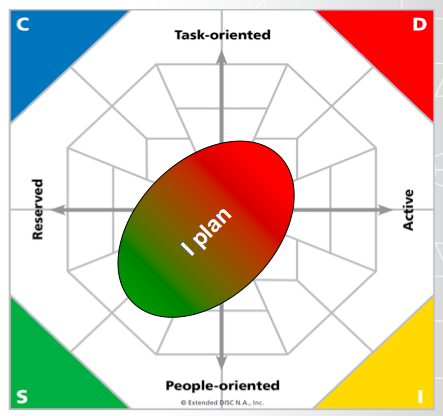 The “I Participate” profile shows up on the People-oriented bottom half of the Extended DISC® Diamond model. 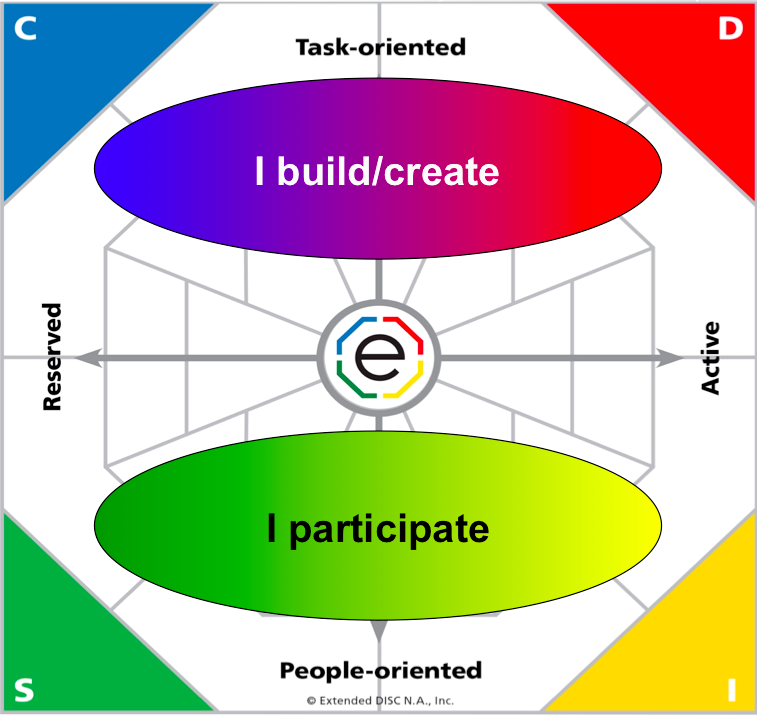 The “I Participate” profile is someone with a combination of I-style and S-style. They are people-oriented styles who prefer to focus on people and feelings over tasks. The “I Participate” profiles are comfortable getting emotionally engaged. They get their energy from interacting with others. The “I Participate” profile is strong at maintaining a positive atmosphere and tends to be a solid team member. They are motivated by personal attention and having group participation. 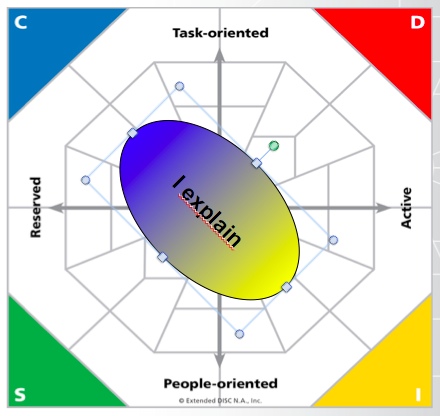 The “I Build/I Create” profile shows up on the Task-oriented top half of the Extended DISC® Diamond model. People, who are “I Build/I Create” profiles, are a combination of the D-style and C-style. These task-oriented profiles prefer to focus on the task and things over people and feelings. The “I Build-I Create” profile works on getting tasks done. They tend to know what they want and how to do it. However, they tend to do it one way, which is their way. They are logical thinkers and are motivated by having information and challenging technical tasks. The “I Plan” profile identify individuals who are a combinations of D-style and S-style. This is one of the Opposite Profile types . These profiles are less common because D-style and S-style tend to be more opposite; the two styles do not share an axis and are the furthest distance from one another on the Extended DISC® model. “I Plan” profiles are deliberate planners. They know what they want and how to get there. They like to organize and plan when given time, and they like freedom to make decisions. The “I Plan” profile looks toward the future and can be very persistent. The “I Explain” profile are individuals who are a combination of I-style and C-style. This is also one of the Opposite Profile types and less common. I-style and C-style tend to be more opposite; the two styles do not share an axis and are the furthest distance from one another on the Extended DISC model. The “I Explain” profiles are comfortable talking and often have the knowledge to know what they are talking about. “I Explain” profiles like to talk and they typically have a lot of information to share. They gravitate to being specialists or quality controllers where they can explain succinctly and in detail. They are motivated by a variety of contacts and talking about specific topics. We can make better decisions when we have more information about a person beyond their primary DISC style. The basic profile types provides a deeper understanding of what a person’s DISC profile truly is. The key to identifying the style of others is to not rush, and continually refining our observations so we can adjust effectively. 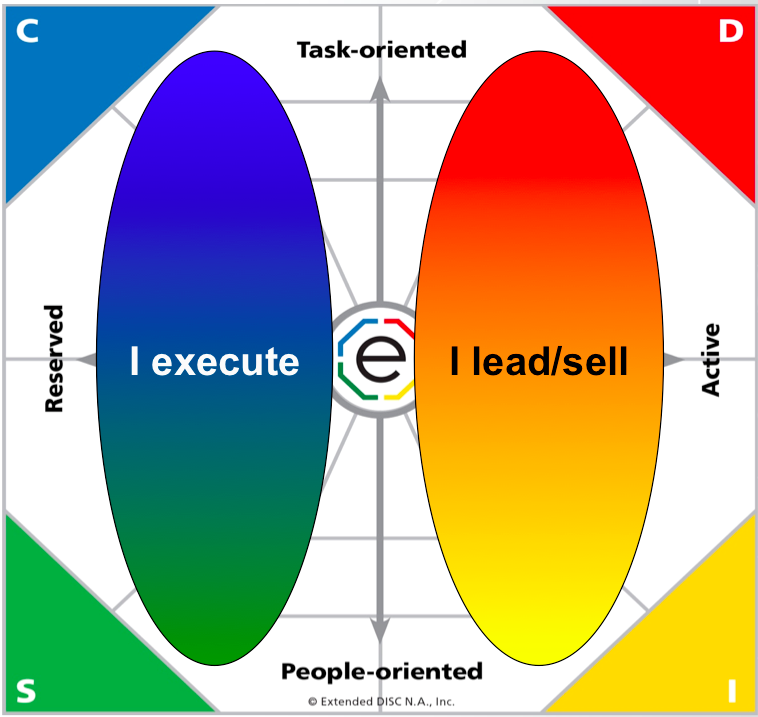 For example, conflict or misunderstanding may occur if one person is a “I Lead – I Sell” profile on the Active side of the model and the other person is an “I Execute,” profile on the Reserved half. However, awareness can help turn it into a positive exchange because we are aware of those differences. We are more likely to complement one another by valuing our differences. 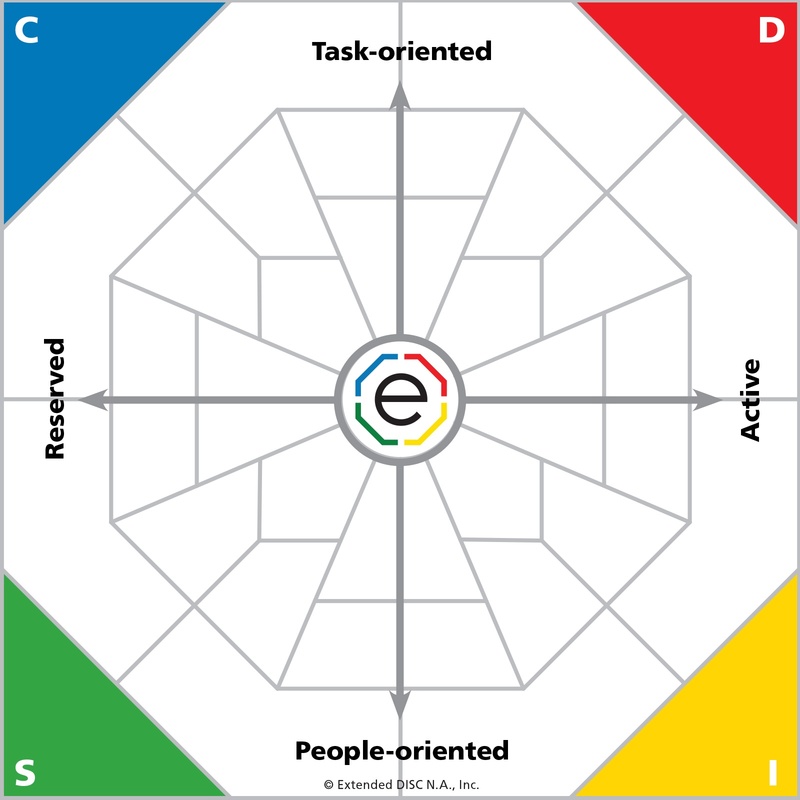 The Six Basic Profile types are just one more way to help us understand DISC profiles and thus, help us achieve a more confident self-awareness of ourselves and awareness of others.